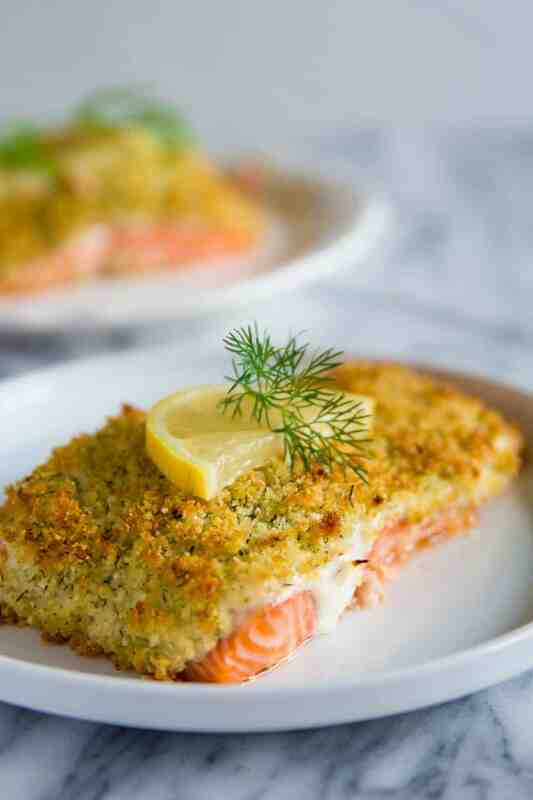 This panko crusted salmon recipe is for all my salmon loving peeps. These salmon fillets are coated in a lemony garlic mayonnaise and baked with a crispy panko-parmesan crust. It really doesn’t get any simpler or more delicious than this. Tip: you can easily make this recipe with a whole fish fillet instead of small fillet cuts. I just used smaller cuts since they look more presentable on the photo. If you love salmon recipes then try these: salmon Wellington, cedar plank salmon, pesto butter salmon. This recipe was originally posted on Dec 13, 2017, we’ve tweaked it a bit since then. Combine the mayonnaise, sour cream, lemon juice, and garlic in a small bowl. Season the entire salmon fillets with salt and pepper. Then transfer the salmon to a rimmed baking sheet lined with foil. Spread the mayonnaise and sour cream mixture on top of each fish fillet. Then, in a bowl, combine the panko bread crumbs, Parmesan cheese, dried dill, and melted butter. 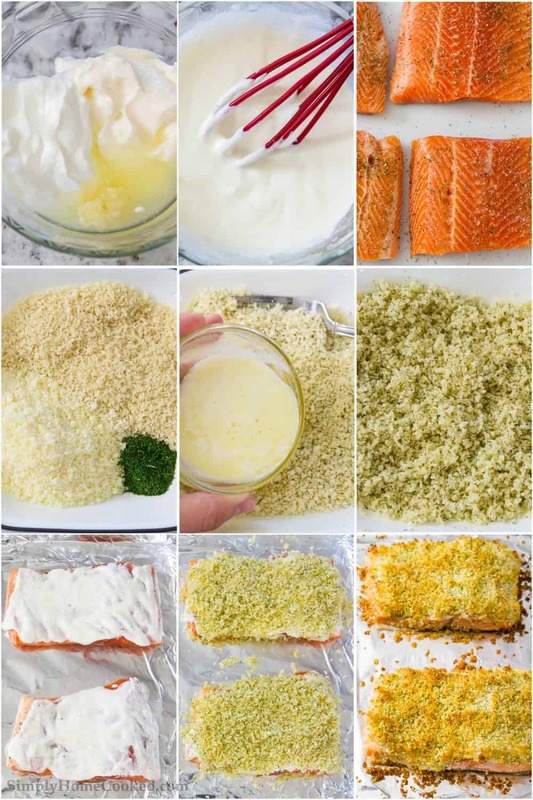 Evenly sprinkle the breadcrumb mixture over the mayonnaise on each salmon fillet. Bake at 400 degrees Fahrenheit for 15-20 minutes. Panko bread crumbs are crumbled pieces of bread that are lighter and flakier than regular bread crumbs. Often used in Japanese cooking. Especially for frying meats and fish. Can I prepare panko crusted salmon ahead of time? You sure can! You can season the fillets and smother them in the mayonnaise mixture, then refrigerate for about 4-5 hours or until ready to use. The panko crust can also be made a few hours in advance. Then, whenever you’re ready to bake the panko crusted salmon, sprinkle the panko mixture on top and pop the salmon in the oven. What to serve with panko crusted salmon? 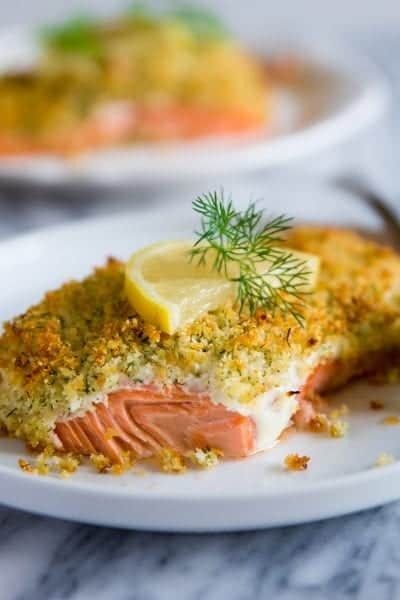 Salmon fillets coated in a lemony garlic mayonnaise and baked with a crispy panko-parmesan crust. A great dish to serve for your dinner guests! Combine the mayonnaise, sour cream, lemon juice, and garlic in a small bowl and set aside. Season both sides of the salmon fillets with salt and pepper. Then transfer the fish to a rimmed baking sheet lined with foil. Spread the mayonnaise mixture on top of each fillet. In a separate bowl, combine panko bread crumbs, Parmesan cheese, dried dill, and melted butter. Evenly spread the bread crumb mixture over the mayonnaise on each salmon fillet. Bake at 400 degrees Fahrenheit for 15-20 minutes. Cooking time may vary depending on the thickness of the fillet.